Bringing order to chaos through organization gives me a singular thrill. Weird, I know. My latest project has been gaining some sort of control over my recipes. I print them off the Internet, clip them from magazines and receive them handwritten on recipe cards from friends. The system I had was working okay; just a square woven basket with homemade dividers (created from envelopes) and a collection of 3×5 or 4×6 cards, 8 1/2 x 11 sheets of paper, and everything from small clipped squares to full-page magazine articles. My goal was to be able to easily access a recipe for cooking and have a setup that allowed me to quickly browse through it when I’m menu planning for the week. I bought a 1 1/2-inch binder, a set of dividers and a package of page protectors from Target. 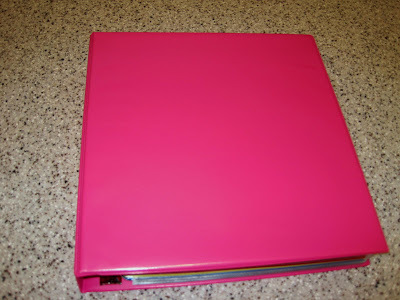 I paid a little more to get a pink binder; having my recipes in the cheaper white or black version seemed just a bit too utilitarian. Many of my recipes were already on 8 1/2 x 11 paper, so I stuck those into the page protectors (most only occupy the front of one sheet, so I could have two recipes per page protector). Once that was done, I decided on the categories I wanted (such as Breakfasts & Sweet Breads, Vegetables & Sides, etc.) and wrote those on the tabs for the dividers. 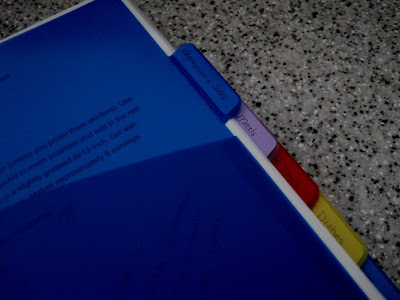 There are quite a few recipes that I still need to type and print; I also want to design a nice cover that I can slip under the plastic on the front of the binder. I figure I’ll spend about $12-15 total on the supplies (not counting the cost of the paper and ink to print the recipes). I’m already wondering if I’ll need to upgrade to a 2 or 3 inch binder later if this one begins to bulge. Here’s where I need help. I’m constantly finding new recipes I want to try. 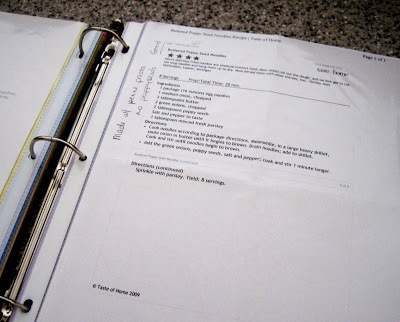 These don’t deserve a “home” in the binder until I’ve made them and determined if they’re “keepers.” Do you have an idea for organizing those loose recipes? 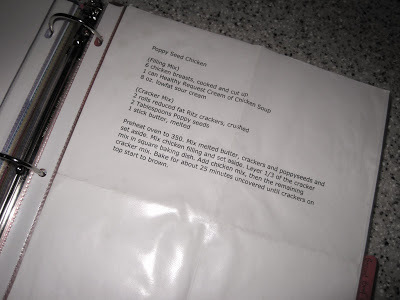 My husband mentioned skipping paper all together and storing my recipes on the computer, but I just can’t make that step yet! I've been wanting to get better with my menu planning. I really need to have a central place with our favorite recipes. Great idea, and thanks for sharing! Admittedly I am not a good recipe person! I've started planning out our meals this month, which helped perserve my sanity during late afternoons – but most of what I are make are tried and true. Every now and then I'll geta recipe off the web – but I just bring the laptop with me and follow the directions on the screen. Not helpful, I know! The answer to your question ~ not very well!! They actually are thrown in cookbooks, folded up in pieces put here and there. This is a project I would love to tackle! You have inspired me ~ your system looks so efficient and organized ~ way to go!! I would think this would not only help with organization but also with menu planning and even saving money as a benefit! Thanks for sharing your system! I do think this will help with menu planning. We'll find out for sure this weekend when I write out our meals for next week. My ten-year-old totally approved of the pink binder, too! I admit to being the main one in the family who likes to try new recipes. I think my husband and children probably prefer the meals they already know they like, so I try not to go overboard in attempting new meals too often. I'm excited to see how this works! Making menu planning easier was definitely one of the factors in putting this together. Like you mention, I had all these pieces of paper folded up or shoved into my basket and, while they were at least categorized, it was somewhat time consuming to pull out and flip through all of the recipes when I needed to plan our meals. I think this will be much quicker and also help me to actually use more of the recipes I have. It's the little things! I got so excited because I finally cleaned out the pile of papers on my desk. ahhhh I feel like a new woman. I recently cleaned out my recipe binder. It's set up very much like yours — a 3" binder with dividers and page protectors. For the randoms and new recipes that I've printed out, I stick those in the front pocket of the binder. That way if I remember putting it there, it means I'm interested enough in the recipe to try it. If it just stays in the front pocket for a long time, I get rid of it. There are a zillion recipes out there, so I don't feel bad about passing on one or three-dozen. I used to put ALL the recipes in the page protectors, but I found I'd flip by a ton of recipes that I never used just to get to the keepers. At this point, if a recipe doesn't get an 8/10 or higher from Joseph and myself, it goes in the recycle. If it wasn't very successful, I honestly won't make it again and it doesn't make sense to keep it. I love my slimmed down binder and I can really see the "meat" of our meals and patterns. If I see I have 18 cookie recipes, it's time to try something other than cookies for a change. Lol! 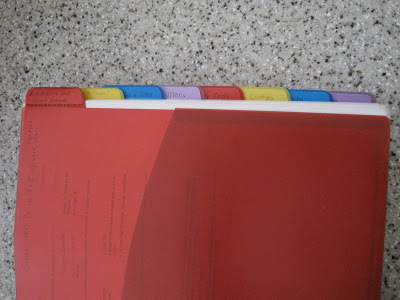 I had thought about using the front pocket of the binder for that purpose; my dividers also have a pocket, so I could take advantage of those for holding random recipes as well. I'm with you on "rating" recipes. If my husband and I aren't really impressed by a dish, I don't keep the recipe. Glad to hear that this system works well for someone else! Good for you! 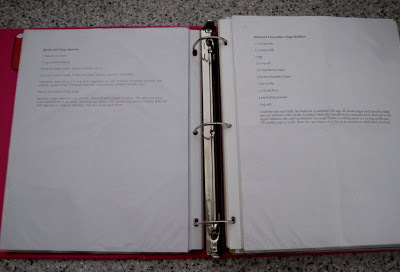 Your recipe binder looks great! I desperately need to do this. I have such a mess in my binder! I have so many now that it looks like a mountain of a job, and while I love being organised… it's just TOO big of a job at this point. One day I'll get fed up and do it though, I always do!! Ah, that is a thing of beauty. I have a binder but it's not divided and I need to go through it and reorgainize it. My big project I want to organize is our paid bills and misc papers that end up on our counters. They're kind of driving me bonkers! 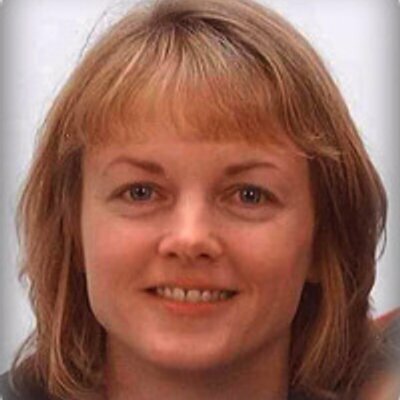 So funny – I've also dashed back and forth from the kitchen to our desk so that I can read a recipe off the computer screen while I'm cooking it! I use a similar system to yours, but I don't use pocket protectors. I just hadn't thought about it, but it sounds like a good idea. When I find a new recipe, I stick it in the front pocket like Emma does, until I use it. Then it gets filed or tossed.